We find that when it comes to organization, there are several approaches you can take that work well. Just like some people like to keep a handwritten planner while others use calendars on their phones, there’s no right or wrong way to organize your jewelry and accessories. Cater the way you organize your jewelry to your personality and organizational style. But regardless of how you like to keep things organized, these tips will help you keep everything looking elegant and beautiful. Enjoy! Keep your jewelry organized in a drawer of a beautiful dresser or vanity for a classy and very “in control” organizational style. Group your jewelry by metal type, color, style and weight so you can easily find the piece you’re looking for upon first glance. We especially suggest drawer organization for your larger pieces, like bangles, cuffs, and large rings. Simply purchase a drawer organizer (or keep the white boxes you jewelry comes in and use them as DIY drawer organizers). Our Monroe and Gretta dressers are some personal favorites that have built-in jewelry drawers! Want a more relaxed approach to your organization? Try draping your jewelry over a piece of sculptural decor for a cool and effortless look. This approach works especially well for chunky jewelry or necklaces that are easy to get tangled. Some of our favorite decor items to try this with are our brass hands or a sculptural piece with branchlike features, such as this charcoal gray coral structure. Perhaps one of our favorite ways to organize jewelry and accessories is the very traditional jewelry box. Clear glass is often used to show off your prettiest pieces, but explore our wide collection of decorative boxes that explore a range of materials, from shell to shagreen to leather, to make the box a true standout piece on a dresser or vanity. For this look, the organization method becomes an essential part of the décor itself. Here’s a secret for anyone out there who isn’t the most organized (but wants to look like they are! ): the tray. Trays instantly elevate your style, and they serve as an effortless way to corral your belongings together. Trays work well on top of your dresser, nightstand, or vanity and should be filled up with you current go-to favorites for easy access. Do you have a bookshelf or display case in your bedroom? 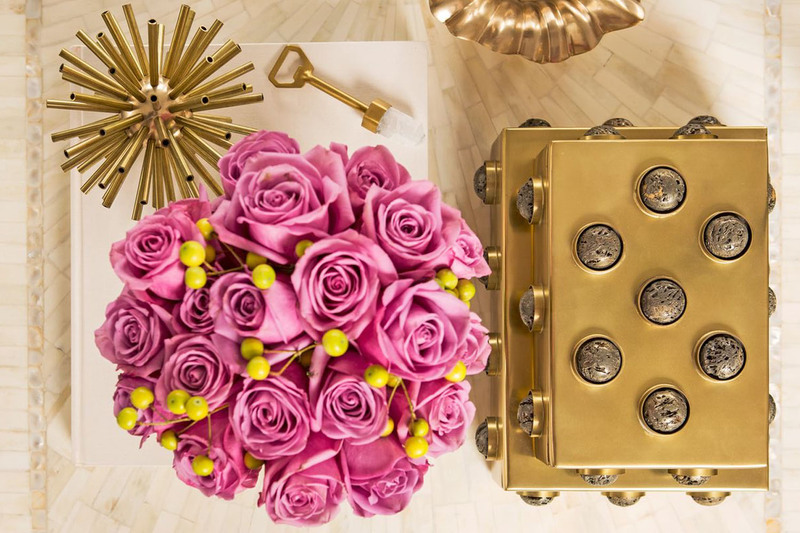 If you’re the type that’s accessorized to a T and proud of your jewelry collection, then consider mixing the above methods to create an artful display. Use small decorative bowls for bracelets and rings, a structural piece for necklaces, and throw in a vase of flowers or a candle to make your jewelry storage appear as its own little vignette. Have thoughts on the article? Comment below!